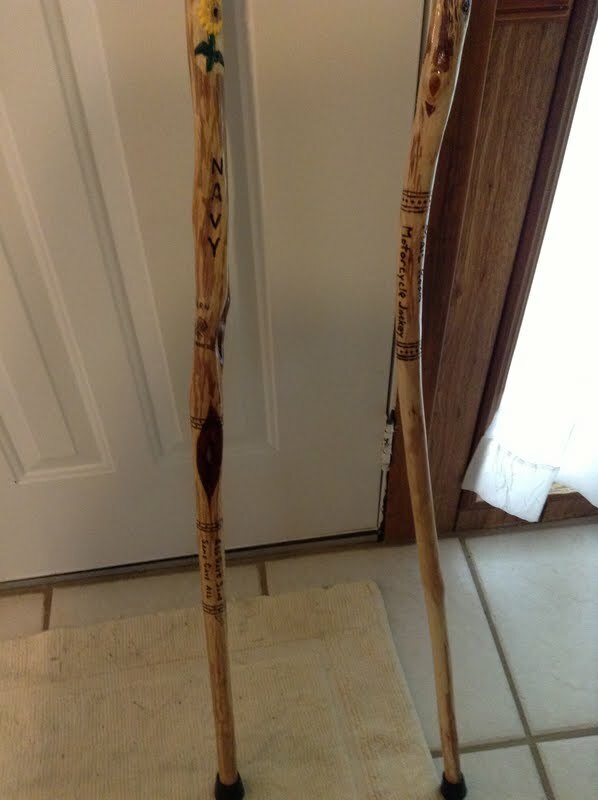 These are sticks I hand carved for my Brother-in-law and Sister-in-law. 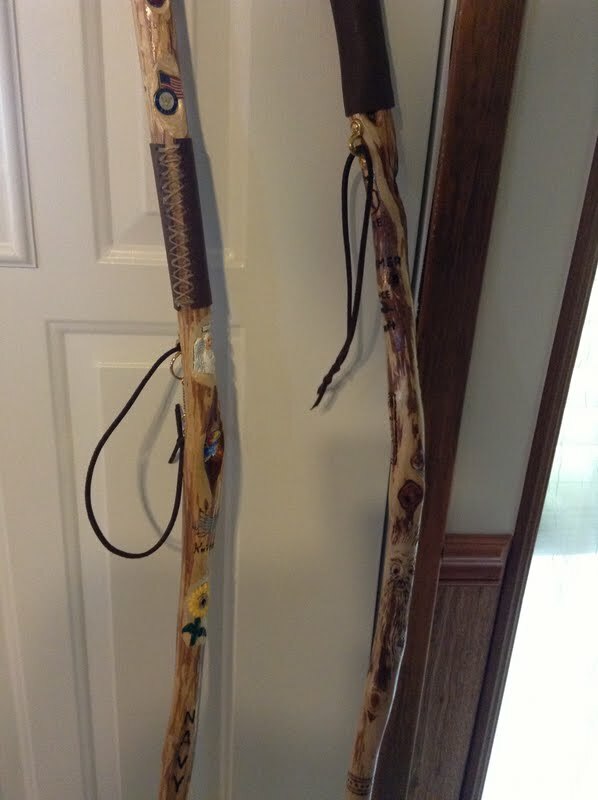 David’s stick is approximately 6′ long, made from diamond willow, approximate 1-1/2″ diameter at the top and 3/4″ diameter at the bottom with a rubber tip. It has multiple diamond shapes up and down the length of the stick. Starting at the top. Eagle carved from butternut and mounted on the top, with a walnut spacer. The following pins have been inlaid and epoxied in place; ICAF (Industrial College of the Armed Forces) pin, Utah state quarter, Utah Beehive pin, Air Force pin. Then a Leather grip laced in place with artificial sinew, Leather wrist leash mount with brass ring screwed to the stick. The following words have been hand carved down the shaft of the stick; John Deere, Hummer, Spruce aircraft, Scitor, “All gave some. Some gave all”, Spinning wheel handcuffs, Skidsteer, Wood spirit face carving. Alpaca tamer, Camel racer, Mail room, and motorcycle jockey. The stick was finished with triple thick polyurethane spray. 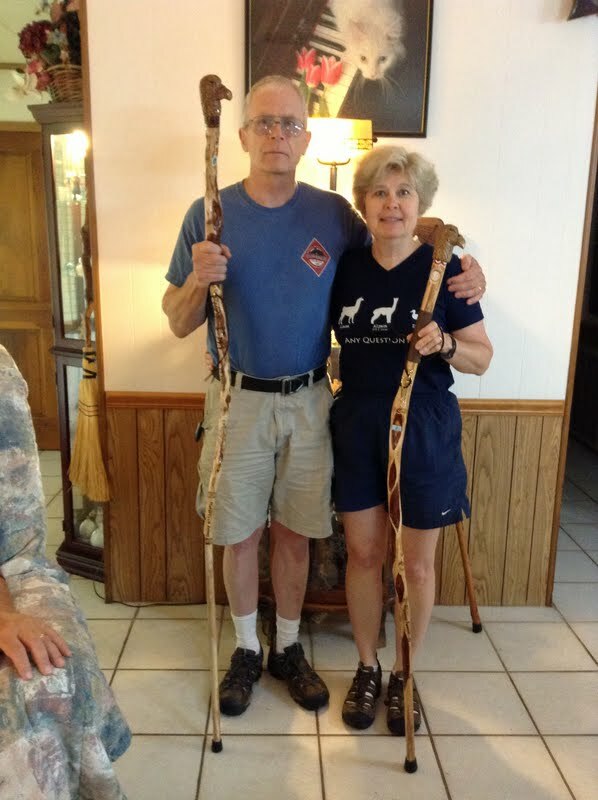 Susan’s stick is diamond willow and approximately 5′ long, about 1-1/2″ diameter at the top, and 1″ diameter at the bottom. There is an abundance of diamond willow figures up and down the length of the stick. Starting at the top. Eagle head carved from butternut. The following pins have been inlaid, ICAF(Industrial College of the Armed Forces) pin, Navy + U.S. flag pin, KU Jayhawk Emblem, Kansas state pin, Leather grip held in place with laced sinew, a leather wrist looped attached with a brass ring screwed to the stick. 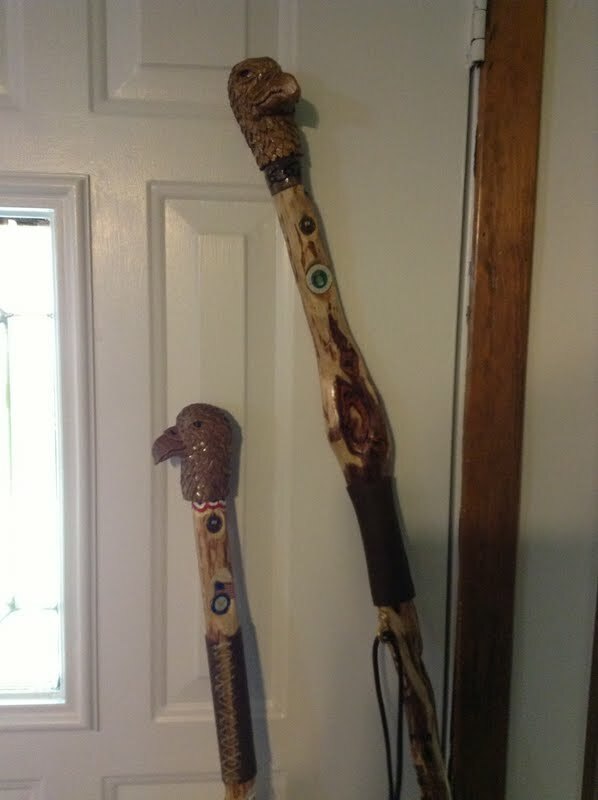 The following items are hand carved down the length of the stick, Angel, painted with white and accented a light wash of blue, Knittin’, Sunflower painted with green stem and yellow flower, NAVY, Yarn spinner and spinning wheel, Alpacas forever, VMI, “All gave some, Some gave all”, and a Red white and blue banner.